Scroll down to see the top not-for-profit colleges offering exercise science degrees online. Students interested in a degree in kinesiology can earn a bachelor or master's degree in the subject through California Baptist University's online programs. The Master of Science in Kinesiology is a 30-credit program that students can complete in as little as 12 months. The program is interdisciplinary, and students take courses in subjects such as the science of human movement, research methods, and advanced studies of fitness and wellness, which includes sport nutrition and fitness testing for special populations. The Bachelor of Science in Kinesiology requires students to earn 50 credits in the major, including movement anatomy, care and prevention of athletic injury, and measurement and evaluation in kinesiology. Students enrolled in the online Master of Science in Applied Exercise Science program offered by Concordia University Chicago can choose from four concentrations. The fitness and health promotion concentration prepares students to become Certified Personal Trainers. The human movement science concentration is for students who want to become corrective exercise specialists. The sports performance and training program is for coaches and athletic trainers, and the sports nutrition concentration prepares students to design and implement nutrition and exercise programs. All the coursework is available online, with no campus visits required. Courses last for eight weeks, and students must complete 10 courses to earn the degree. Cohorts are formed to enter the program at three times each year. Concordia St. Paul offers online bachelor and master's programs in exercise science. The Bachelor of Science in Exercise Science is a degree-completion program designed for adult learners who already have some college credits. The major requires students to earn 41 credits in exercise science classes, including coursework in human movement, exercise, and health psychology. Students must complete 128 credits, including general studies, to earn the degree. The Master of Science in Exercise Science requires 33 to 36 credits. Required courses cover topics such as statistical analysis, exercise physiology, the psychology of sports, clinical exercise assessment, and nutrition and metabolism. Candidates must complete a capstone project or thesis. Concordia's online classes follow a seven-week format. Experienced coaches and new coaches who wish to improve their skills and knowledge base can earn a Master of Science in Kinesiology with an emphasis in coaching education through an online program offered by Georgia Southern University. Online coursework covers topics such as athletic training, coaching effectiveness, coaching administration, and performance enhancement. To earn the degree, students must complete 12 courses for 36 credits. Students can complete the program in four semesters, taking two classes each semester, and taking advantage of the two summer sessions to complete four courses each summer for two summers. The curriculum offered by Georgia Southern follows National Coaching Standards for Level 5 Coaching Status. Missouri Baptist University offers an online Master of Science in Fitness Management that combines classes in exercise science with business and management classes to qualify students for jobs in the growing fitness industry. Courses include principles of human performance, chronic disease and obesity, sport finance, sport facility management, and sport psychology. As a capstone project, students enrolled in the program put their knowledge and skills to work during an internship at a fitness club, rehabilitation facility or coaching assignment. The program is open to recent graduates with exercise science degrees as well as professionals who work as athletic or personal trainers, wellness counselors, physical education teachers and others. Students may take classes full time or part time. Southern Utah University has a long tradition as a "coaching factory," and its online Master of Science in Sport Conditioning and Performance enables students to take part in that tradition from a distance. The online degree is designed for coaches, athletic trainers, personal trainers, physical therapists and other fitness professionals. Students can complete most coursework online, but they will be required to be at the SUU campus for one to two weeks one summer to complete intensive clinical workshops. Applicants must have a bachelor's degree in a closely related field or have a bachelor's degree and be a certified or licensed fitness professional. Students must earn 18 credits in required courses, 12 credits in electives, and must complete a thesis. Students who want to concentrate in athletic administration or health promotion can earn a Master of Science in Health, Kinesiology and Sport Studies in a completely online format through Texas A&M University Commerce. The athletics administration program is designed specifically for full-time teachers and coaches, who can complete the 30-credit program in a little over a year by taking nine credits in the spring and fall and six credits during the summer for two summers. The program uses a cohort format. The health promotion concentration is designed for professionals who work in the wellness industry and covers topics such as planning and implementing health promotion programs and health promotion for special populations. Thesis and non-thesis options are offered. The University of Texas Tyler offers an online program leading to a Master of Science in Kinesiology. The program is designed for students with a variety of career goals, including corporate health and wellness, coaching, personal trainers, athletic trainers, and physical therapists. The curriculum features 18 credits in required classes, 12 credits in electives, and a choice of a thesis or internship. Required classes cover topics such as motor learning, biomechanics, and exercise physiology. Students may select electives from the Department of Health and Kinesiology or seek permission to take courses offered by other departments. Applicants should have a bachelor's degree in a related field of study and a minimum 3.0 GPA. The University of Texas Permian Basin offers an online program leading to a Master of Science in Kinesiology as part of the UT Online Consortium, which allows students to take online courses offered by several universities within the system, although they must be accepted into a specific university's program. To earn the degree, students must complete 36 credits, including a capstone project or thesis. Applicants to the program must have an undergraduate degree in kinesiology or a related subject with a minimum GPA of 3.0 in upper division coursework. There is no practicum requirement for the degree. The program is designed to meet the needs of physical education teachers, coaches, and other professionals. The United States Sports Academy offers a fully online program leading to a Master of Sports Science. Students earning the 33-credit degree have the choice of majoring in sports coaching, sports health and fitness, sports management, sports studies, or recreation management. Students may also pursue a double major, which requires 42 to 45 credits. In addition to majors, students can select an area of emphasis, such as NCAA compliance, Olympism, sports psychology, or sports hospitality management. Students may choose a thesis option, mentorship option or non-thesis option. Students who do not write a thesis must sit a comprehensive exam. The Sports Academy is a member of the National Council for Accreditation of Coaching Education. The University of Louisiana Monroe offers a completely online Master of Science in Exercise Science with a specialization in sport, fitness and recreation management. The program is designed for students who would like a career in sport management or a related field. Curriculum covers topics such as sport sociology, governance and ethics in sport, and research and statistical methods in exercise science. Classes in the sport management specialization include finance, law, and marketing of sport, fitness and recreation. The program requires 36 credits, and three credits may be earned through an internship. The program requires all candidates to take comprehensive exams. ULM allows students to begin the program in the spring or fall semester. The University of Northern Colorado offers an online Master of Arts in Sports Coaching that combines applied coaching with academic knowledge and the latest technology. Students can start the 30-credit program in any academic term. Courses cover topics such as sports psychology, injury prevention, principles of training and conditioning, teaching sports, and applied coaching research. Candidates must take part in a graduate internship in sport and exercise science. Students can take one course at a time,and in place of a thesis or exam, they are required to develop a portfolio showing how they have incorporated the theoretical aspects of successful coaching. Applicants to the program should have a bachelor's degree with a minimum 3.0 GPA. The online master's degree in exercise and sport science is designed to provide students with advanced training within a specific area under the umbrella of exercise and sport science. This program is targeted toward students who are interested in wellness, health and fitness and/or exercise as a preventative component for overall health and well-being. There are two concentrations available (Health and Wellness Promotion or Nutrition), each of which begins with a set of common core courses followed by specialty courses that begin around the fifth academic quarter. Exercise science is a hands-on discipline, and it can be tricky to find strong, regionally accredited undergraduate programs that are 100% online. You’ll have a much easier time with online programs in exercise science at the graduate level. You may also be able to enroll in online degrees in related disciplines (e.g. coaching) or hybrid programs that arrange local practicums and internships. We talk more about your options below! Still can’t find anything that suits your needs? Have a look at our guide to Affordable Exercise Science Degrees. Along with profiles of budget-friendly campus programs, you’ll find a breakdown of each degree level (e.g. sample coursework and career opportunities), an explanation of accreditation acronyms, and tips on pursuing teaching licensure and professional certifications. Can You Find One? Online associate degrees in exercise science or kinesiology from regionally accredited schools are practically non-existent. You may be able to find relevant AA and AS programs at your local community college or junior college. You can then transfer your credits to a degree completion program for an Online BA or BS in Exercise Science (see below). Do You Want to Commit to Online Learning? Undergraduate programs in exercise science tend to have a lot of courses with labs, demonstrations, and practice-based training. We urge you to think very carefully before you commit to a four-year online bachelor’s degree. Fundamentals may be hard to learn via distance learning. Would a Degree Completion Program Work Instead? Some schools offer online degree completion programs to students who already have an associate’s degree or college credits. For example, Concordia St. Paul University’s Online BA in Exercise Science is designed for adult learners who already have some college credits and work experience. Does it Include On-the-Job Experience? Strong online undergraduate programs in exercise science should prepare you for the real world. For instance, Concordia St. Paul University’s Online BA in Exercise Science includes a mandatory internship in the student’s local area and a senior professional seminar that focuses on career preparation (e.g. developing a résumé and professional portfolio). Can You Transfer Academic Credits Easily? If you want to transfer your associate degree or general education (GE) credits to an online bachelor’s degree, check with the university on its transfer policy. For example, California Baptist University waives most of the GE requirements for California students who hold an IGETC or CSU GE certified associate’s degree from a California community college. What Do You Want to Specialize in? Master’s programs are the most popular online degrees in the field of exercise science. That means you can choose majors & concentrations in everything from kinesiology or sport science to athletic administration or physical education. You may even wish to focus on specific topics such as corrective exercises, fitness & nutrition, sports psychology, or even NCAA compliance. Explore all the options in our list—you’re sure to find something in your ballpark! Why are Kinesiology Programs Popular? Kinesiology is the study of movement, so it acts as a catchall title for interdisciplinary master’s programs that focus on exercise. Kinesiology programs can work for students with an assortment of career goals, including physical education teachers, coaches, personal/athletic trainers, and corporate health & wellness experts. Look for degrees with relevant concentrations and electives in your area (e.g. health promotion), and the opportunity for internships or fieldwork. Are You Interested in Coaching? There are plenty of online options that will fit the bill. You might take a look at the curriculum for Georgia Southern University’s Online MS in Kinesiology with an emphasis in Coaching Education. Or the Online Master of Sports Science with a major in Sports Coaching from the United States Sports Academy. Or the NCACE-accredited Online MA in Sports Coaching from the University of Northern Colorado, which includes a graduate internship. Are You Interested in Sports Management? Just like coaching, there are plenty of online graduate programs to go around—check out our rankings of the Top Online Schools for Sports Management for more details! Does it Offer an Internship Experience? Internships will give you an extra edge after graduation. Not only will you gain real-world experience, but you’ll walk away with letters of recommendation. For example, Missouri Baptist University’s Online Master of Science in Fitness Management includes a capstone project where students complete an internship at a fitness club, rehabilitation facility, or coaching assignment. Does it Prepare You for Professional Certification? If you’re interested in earning professional certifications in exercise science, there are an online programs with relevant curricula. For instance, Concordia University Chicago’s Online MS in Applied Exercise Science has matched the coursework for its concentrations to relevant credentials, including the Certified Personal Trainer (CPT); Corrective Exercise Specialist (CES); Performance Enhancement Specialist (PES); and the Certified Sports Nutritionist (CISSN). Can You Find One? The answer is yes, but they’re rare. Examples include Concordia University Chicago’s Online PhD in Leadership – Health & Human Performance; the University of North Carolina at Greensboro’s Online EdD in Kinesiology; and Northcentral University’s Online PhD in Sport and Athletic Management. All of these are regionally accredited schools. UNCG’s program includes three required campus visits. How Do You Feel About Distance? Doctoral programs can be tough, especially when you’re not able to meet with your supervisor face-to-face. Make sure the university provides you with plenty of support throughout the program and easy access to research materials. For comparison’s sake, have a look at the list of on-campus doctoral programs from the National Academy of Kinesiology. Can You Find One? Like online doctoral programs, online certificates in the field of exercise science are not very common. But they do exist. Examples include the University of Connecticut’s Online Graduate Certificate in Exercise Prescription; Texas Woman’s University’s Online Graduate Certificate in Leadership in Education and Sport; and Michigan State University’s Graduate Certificate in Sport Coaching and Leadership. Does it Prepare You for Professional Certification? Exercise science is awash with professional certifications. If you’re lucky, you may be able to find online certificates that can help you qualify for certain credentials or prepare for exams. The university should state this explicitly. Will Your Credits Transfer to a Degree? Whatever the title of the graduate certificate, always make sure that your online credits will transfer smoothly to a master’s program (online or on-campus). You may not want a degree now, but you don’t want to repeat courses if you choose to apply for one later. Can You Enroll if You Live Out-Of-State? Most universities have reciprocity agreements that allow students from other states to enroll in distance learning programs. But there are pesky exceptions to this rule. For example, the University of Connecticut’s online programs are open to residents of all 50 states, but UConn is currently not authorized to deliver distance learning to students residing in Guam, American Samoa, Northern Mariana Islands, and Puerto Rico. Check the State Authorization page on the university’s website for details. Does the Program Work With Your Schedule? As a distance learner, you can often take advantage of multiple start dates, shorter terms, and asynchronous classes (i.e. there’s no need to log in at a certain hour). But be aware that some programs will expect you to visit the campus at least once. For example, Southern Utah University’s Online MS in Sport Conditioning and Performance requires that students set aside one to two weeks during one summer to complete intensive clinical workshops at SUU. If you can afford the travel costs, these programs are worth investigating. There’s no substitute for experience. What is the Credit Transfer Policy? This is important if you’re considering a bachelor’s degree completion program or you’re planning to apply credits from a graduate certificate to an online master’s program. Every university has a different policy (e.g. a school might only accept 6 transfer credits into a master’s degree), so we always recommend you read the fine print and talk to the program coordinator. Is the Coursework & Training Relevant? The best online degrees in exercise science have a “secret sauce.” They require you to design your own nutrition or exercise programs. They make internships and capstone projects mandatory. They find a way to include training in health & fitness testing. They ask you to apply research-based practices to your current job. You’re paying good money for your degree—you deserve to get the most out of it. Who is Teaching Your Online Course? Universities like to boast that their on-campus faculty also work online, but you don’t have to take their word for it. If you delve into the program’s course schedule, you’ll usually find the names of the actual instructors. Have they coached? Have they managed a team? Have they worked as an exercise physiologist? Have they directed a research lab on military performance? What is their current area of research? You want strong, engaged teachers who will support your career goals. How Does the Program Support Online Students? Distance learning can be challenging, especially if you’re unfamiliar with the teaching format and you’re juggling other responsibilities at home. We give full marks to colleges and universities that have a support system in place for online students. Virtual tutoring, career counseling, tech support, mentorship—these are the kinds of services we like to see. Are There Hidden Costs? Check the tuition & fees page very carefully. Even if you don’t have to pay for campus facilities, schools will often saddle you with fees for distance learning or technology. You may also have to pay an application fee. Is Financial Aid Available to Online Students? As long as you are attending a regionally accredited school, your online undergraduate degree or online graduate degree will usually qualify for financial aid. However, certificates are non-degree programs that are typically ineligible for aid. Visit the website of the Office of Financial Aid for assistance. It’s also important to research all your options, especially if you’re considering graduate school. Instead of taking out a loan, you may be able to cover costs with external scholarships, employer reimbursement, loan forgiveness, etc. Do Online Students Receive a Tuition Discount? Public and state universities often give generous tuition breaks to online undergraduates (and sometimes to graduates) who reside in their state or in neighboring states. Other universities offer great tuition discounts to online students regardless of their location. Policies vary between schools, so visit the tuition & fees page for details. 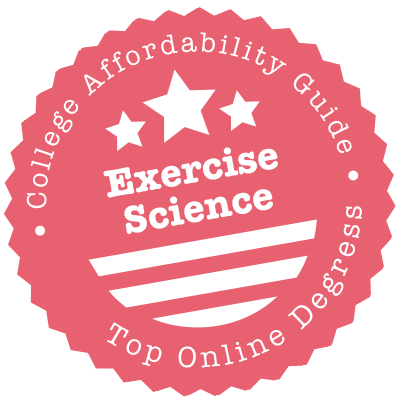 If you have any concerns about a university offering an online program in exercise science, check the state where the university is located and then have a look at our Online State Rankings. Under each state, we have a detailed list of Online Schools with Accreditation & Quality Concerns. The following universities appear in our rankings of Top Affordable Schools for Exercise Science and Top Online Schools for Exercise Science. That means they have met some extremely tough criteria for quality, flexibility, price, and use of financial aid money (you’ll see a CAG Score next to their profiles). GSU’s Online MS in Kinesiology, with emphases in Coaching or Physical Education, and its Online MS in Sport Management are run by the Waters College of Health Professions. Current info on tuition & fees can be found in the Bursar’s Office. In-state and out-of-state online graduate students pay the same tuition rate. The Office of Financial Aid can assist with federal financial aid applications and offer advice on alternative sources of funding. Once you’ve assessed your tuition costs, check out MyScholarships @ Georgia Southern University. GSU has some funds for graduate students. For example, the Sandra L. Gallemore Endowment funds a scholarship for female graduate students in physical education/kinesiology or a related field of study (preference is given to students pursuing a Master of Science in Kinesiology with a concentration in PE). UT’s Online MS in Kinesiology is part of the UT Online Consortium, where you’ll find a comprehensive section on Cost and Financial Aid. It’s important to note that you can earn this degree through the University of Texas at El Paso (UTEP), the University of Texas of the Permian Basin (UTPB), or the University of Texas Rio Grande Valley (UTRGV). Whichever university you choose, you’ll find that Texas residents pay less in tuition! Once you’ve selected your university, visit the school’s Office of Financial Aid. Thanks to an agreement signed by various UT presidents, UT Online Consortium programs meet financial aid requirements at UT System academic institutions. Remember, too, that separate universities may have different scholarship funds available. For example, UTEP offers graduate scholarships to students pursuing their master’s or doctoral degree in all areas of study. Whatever your final choice, opt for an exercise science program that comes from a school with regional accreditation. This accreditation is given to an institution, not an individual department or degree, so it will cover both on-campus and online programs. We talk about the Commission on Accreditation of Allied Health Education Programs (CAAHEP) in the Accreditation section of our guide to Affordable Exercise Science Degrees. It’s a well-known and well-respected organization that specifically accredits programs in exercise science and related fields (e.g. physical education, kinesiology, etc.). CAAHEP accredits distance learning programs, but there are only a limited number that have received the honor. And as of 2018, there are were no CAAHEP-accredited online programs in exercise science. You can use CAAHEP’s Find a Program tool to search by subject and format (under Search For, choose “Accredited Online/Distance Education”). National Council for Accreditation of Coaching Education (NCACE) accredits coaching educational programs that meet or exceed requirements that are essential to the preparation of well-qualified coaches. The curriculum for these programs dovetails with the knowledge and skills described in Shape America’s National Standards for Sport Coaches. There are three levels of NCACE accreditation: Level 1, Level 3, and Level 5. Level 5 accreditation is rare—it’s usually granted to master’s degrees and coaching programs focused on advanced training & conditioning for elite athletes. The NCACE accredits online programs (e.g. University of Northern Colorado’s Online MA in Sport Coaching: Level 5), but not many universities measure up to its high standards! The Commission on Accreditation of Athletic Training Education (CAATE) is a national accrediting body for athletic training degrees. It’s an important organization to know about if you’re thinking of becoming a Certified Athletic Trainer (ATC). You must attend a CAATE-accredited education program if you want to sit for the BOC exam and become an ATC. By 2022, anyone seeking certification will be required to hold a graduate-level degree in athletic training. Because the ATC is a professional credential that requires hands-on training, you’re unlikely to find online programs that are CAATE-accredited. But you may be able find hybrid programs that include online components. Degrees in exercise science, sports medicine, physical education, physical therapy, strength and conditioning, etc. do not satisfy the education requirement for the BOC exam. Search for a CAATE-Accredited Program. We provide a bit of background on the Commission on Sport Management Accreditation (COSMA) in the Accreditation section of our guide to Affordable Exercise Science Degrees. It accredits sport management education programs at the baccalaureate and master’s levels. The good news? COSMA considers all sport management programs, regardless of their mode of delivery, for accreditation. That includes online programs, distance learning programs, adult degree completion programs, accelerated programs, and other “nontraditional” programs. Thinking of teaching PE in a K-12 public school? You must have a state teaching license. (Private schools may not require state licensure, but they’ll generally expect you to hold a degree.) We talk about the state licensure process and options for obtaining an education degree in our guide to K-12 Education Degrees. Be sure to check with your State Board of Education for exact details on licensure. Many states have specific requirements for PE teachers (e.g. a state-approved bachelor’s degree in physical education, completion of a teacher preparation program, and passing scores on Praxis II content-area tests). Alternative pathways may be available, but initial licensure is going to involve an on-campus or hybrid program. Once you have your initial license, you may find you need to earn a master’s degree (e.g. MEd in Physical Education) to maintain your licensure or gain endorsements. Happily, there are CAEP-accredited, 100% online degrees that can help you achieve this goal. Again, check with your State Board to see what they will accept as the education requirement. We have a full rundown of relevant professional certifications in our guide to Affordable Exercise Science Degrees. These are voluntary qualifications (e.g. ACT, CPT, CES, etc.) from recognized organizations (e.g. ACSM, NATA, NASM, etc.) that you can use to improve your career prospects and qualify for certain jobs. Universities will usually state if their online programs can help you prepare for professional certifications. When in doubt, ask.